While visiting Nelspruit, it is well worth your while to take in the beautiful surrounding areas. Graskop is one of those small towns sitting neatly on the Panorama Route. It was once a popular tourist destination, mostly for those passing through, while now it has firmly fixated itself as a must visit place. This small town serves the timber industry, with plantations surrounding the town and back in the day, it was a gold mining camp that dates back to the 1880’s. The town itself is a great place to stop for lunch and pick up a few souvenirs but most visitors will find the real adventures just outside the town. 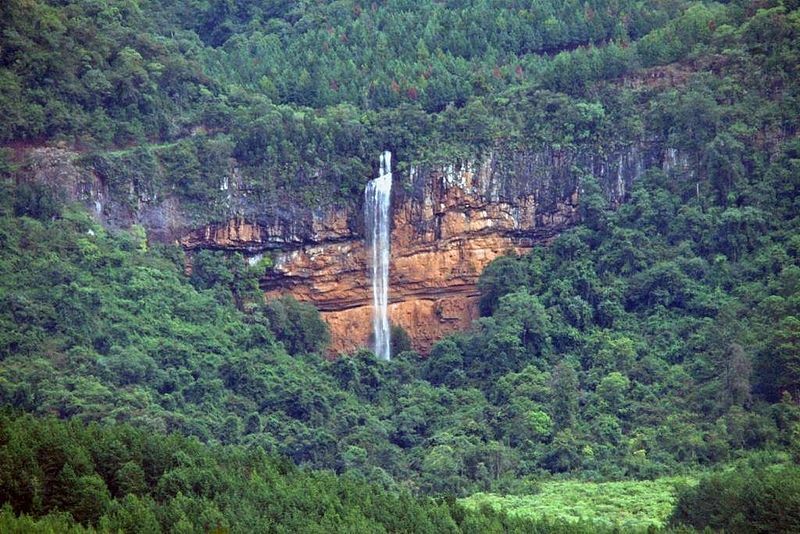 Scattered around Graskop you will be able to view several waterfalls. Lisbon Falls is said to be one of the most scenic in the area. The Lisbon River separates into three before tumbling 94 meters over a semi-circle rock face, making the Lisbon Falls the highest in the province. The Lisbon Falls are easily accessible for tourists and while you are there why not pack a picnic basket as there are picnic spots available under the shade of lovely trees. Tumbling down 80 meters from the Sabie River is the Berlin Falls. This waterfall cascades into the most beautiful jade coloured pool below and is surrounded by red cliffs. The Berlin Falls are best observed from the platform above. Not the highest but by far the most stunning, the Mac Mac Falls plummets 70 meters into a gorge below. Mac Mac Falls is split in two but was not always so. Back in the gold rush days, gold miners actually blasted the rock in an attempt to reach the gold-bearing reef behind the falls thereby splitting the falls into two. During the dry season, you will find that the falls revert back to one stream. Mac Mac Falls has a braai and picnic area as well as several pools where you can cool off after a day of sight-seeing. Mac Mac Falls also has a 3km “Secretary Bird Trail” which offers a delightful walk through the bush. If you looking for a one of a kind experience, a definite must is a visit to the Graskop Gorge Lift. Guests can hop into this passenger elevator and travel down 51 meters of cliff face into the lush green forest below. Once down in the forest, you will find a massive network of trails made up of suspension bridges and elevated walkways. Also to be seen from the walkways is the Panorama Gorge Falls that stem from the Motitsi River, before crashing down 70 meters into the gorge below. Small retail outlets, a bar and restaurant are balanced on the edge of the cliff and make this an unforgettable experience. Finally, you can take a hike on a three-hour circular trail that starts and ends at the Graskop Holiday Resort. This hiking trail is known as the Jock of the Bushveld or Fairyland hike, and is roughly 8km long. Walking along the escapement, you will find yourself overlooking the Pinnacle Gorge. En route you will pass Sir Percy Fitzpatrick’s overnight camp as well as pass some oddly shaped rocks known as Fairyland. The only expense you will have on this walk, is the price of your sunscreen, as there is precious little shade. Book your stay at Nelspruit Lodge and experience the vibrancy of Mpumalanga. Our Nelspruit accommodation is affordably priced and centrally located, making it ideal for tourists and those visiting on business.